Below you will find answers to some common questions about our organization. If you would like to get involved or donate, please give us a call at 417.339.3804 or click HERE to donate online. • How long has CORE been in operation? Founded in 1995, CORE serves the Midwest as the premier one-year recovery program offering hope and a future to many addicts who did not think there was a way out of their addiction. On January 1 of 2013, CORE was recognized as a 501 (C) 3 nonprofit corporation and provided a Recognition of Exemption by the Internal Revenue Service. CORE provides programming and housing for 250 men and women who are seeking recovery from addiction. • Is CORE a faith based organization? God is the center of our program and we believe that through faith in God all things are possible. • Does CORE accept donations? Being a non-profit, donations are very important to the level of services provided. CORE accepts donations of money, furniture, vehicles and just about anything of value. Please visit our donation page or call Tami at 417.339.3804 to make arrangements. • What is the organization structure of CORE? CORE is a 501 (C) 3 not for profit organization as recognized by the Internal Revenue Service. A Volunteer Board of Directors oversees the management of the organization and provides direction to an Executive Director. The Executive Director is responsible for the day to day operations of the organization and the supervision of all employees. 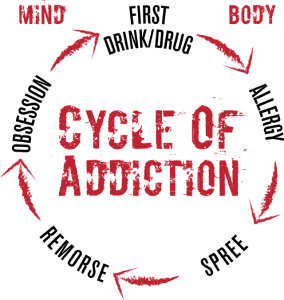 • What is the cycle of addiction? CORE emphasizes lifestyle and behavioral changes that lead to breaking the cycle of addiction that all addicts find to be a part of their life experience.